Once it comes to downloading the files from Internet we have noticed one trend these days. The average file size you have to download keeps increasing every year. Today’s apps look great and have plenty of functionality but it all comes with the increased actual application download size. Similar goes to video and audio files – better quality but larger sizes. This is where download managers can help us to speedup the actual download time. Here on Enfew we have published list of most popular file download managers in 2010. This list has the links and print screens for the best ones in 2013. Enjoy! Folx is a free download manager for Mac offering a lot. Free Folx will split your downloads in threads, resume those downloads that were interrupted for some reason, and it has a promising feature of managing and organizing downloads in a smart way. It can be integrated with all popular web browsers. 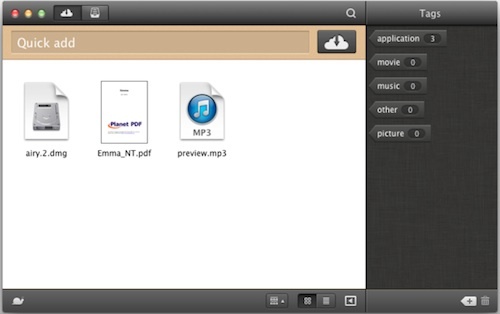 File management system of Folx allows finding any downloaded file the quickest possible. It offers a unique possibility of tagging your downloads whatever you like. One can assign multiple tags to a download describing it as detailed as possible and find the downloaded content on the hard drive at any time, no matter how long ago it was downloaded. Basically if you don’t remember where you could’ve saved the files, just describe them to Folx and it will find them. There is much more one can get by upgrading to Folx PRO for $19.95. It adds the following possibilities: you can schedule your downloads and set the Folx behavior upon finishing downloading (system shutdown, sleep mode, or simply quit the app); you can control the download speed, either manually or automatically; split the downloads in up to 10 threads for faster downloading; send the downloaded music and videos to iTunes playlists automatically. As well as Folx download manager we had iGetter on the list in 2010 as well. It didn’t change much since then. 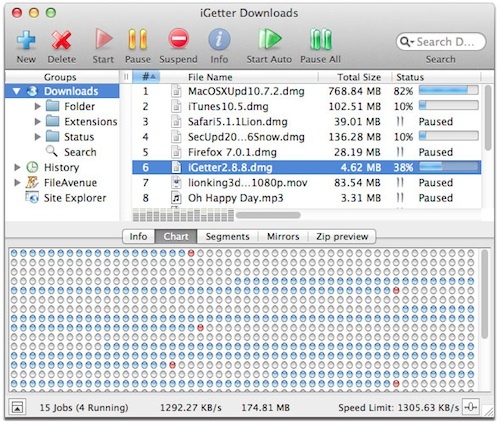 iGetter is a well-known download manager that consists of two main parts: download manager and download accelerator. It allows multiple downloads at a time that can be started and stopped when needed. To accelerate the download process it uses downloading over several streams. It also has the ability to resume interrupted downloads. iGetter is a free app, but if you need support for it you’ll have to buy a license for $25. JDownloader is aimed to simplify downloading from such sites as rapidshare or megaupload or else. JDownloader offers downloading in multiple parallel streams, automatic file extraction, and supports captcha recognition. The upside is that JDownloader is an open source Java project with the strong community for support. Its downside though is not very friendly interface, but for more experienced users who put in some time to learn about the app it can become very helpful. Leech allows controlling downloads and can integrate with your web browsers. Downloads can be queued, paused, and resumed. It downloads from password-protected servers and stores your passwords in a secure key chain. This download manager costs $25 and offers convenient and flexible downloading from the web. 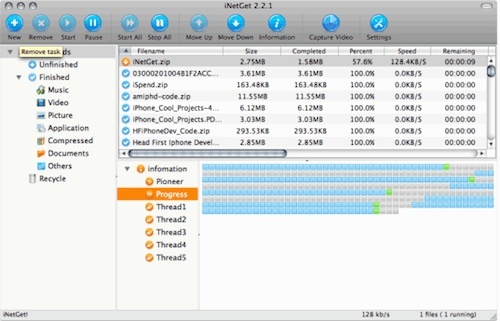 InetGet offers automatic resuming of downloads and multi-thread downloading to increase the speed. InetGet can automatically sniff and download any FLV, MP4 video from YouTube or any other video hosters. 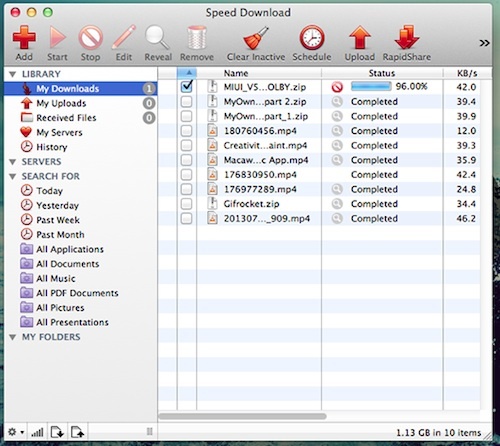 Speed Download is a famous download manager that unfortunately doesn’t support the latest Mac OS X Mavericks (10.9). Speed Download conveniently combines 4 products in one app: turbo-charged download manager with the possibility to auto-resume downloads, then a fully featured secure FTP client, a file sharing program with full encryption, and also has a complete .Mac/iDisk/WEBDAV connectivity.